Discover the beautiful island of Santorini with your own personal guide on this 4.5-hour shore excursion. See the highest peak of the island, Profitis Ilias, where a monastery sits; explore the village of Oia, built on a steep slope of the volcanic caldera; and enjoy a short cable car ride in Fira to return back to the pier. Learn the rich history behind the Greek island as you follow your guide past the rocky landscapes, vineyards and views of the coast. Commencez votre excursion au port de Santorin, où vous rencontrerez votre hôte et monterez à bord d’un petit bateau en direction de Fira. À votre arrivée à Fira, rejoignez votre guide privé et prenez la route en direction du plus haut sommet de Santorin, Profitis Ilias. Apprenez l’histoire de la région grâce à votre guide et n'hésitez pas à poser des questions lorsque vous remontez la montagne en admirant la vue sur les vignes et le terrain rocheux. Au sommet, rejoignez Profitis Ilias, l'un des plus anciens monastères de l'île, construit au début du XIXe siècle. Autrefois une école grecque, il abrite aujourd'hui une importante collection d'iconographies et de bibles orthodoxes grecques et offre une vue imprenable sur l'île depuis son perchoir de 1 853 pieds (565 mètres). Visitez ensuite le village d'Oia, construit sur une pente raide de la caldera. En vous promenant dans les rues étroites avec votre guide, parcourez les magasins locaux regorgeant de bijoux artisanaux, de peintures et d’œuvres en céramique. Oia présente également une vue imprenable sur Fira depuis son emplacement au bord des falaises. Ensuite, dirigez-vous vers Fira, où vous pourrez faire un court trajet en téléphérique pour rejoindre votre jetée. Nous veillerons à votre retour rapide au port de Santorin pour cette activité. Dans les rares cas où votre navire partirait, nous organiserons le transport jusqu'au prochain port d'escale. Si votre navire est en retard et que vous ne pouvez pas assister à cette activité, votre argent sera remboursé. Voir nos termes et conditions pour plus de détails. Remarque: vous pouvez demander à votre guide privé de prévoir du temps libre lors de votre visite afin de pouvoir prendre une collation ou un déjeuner (à vos frais). Veuillez le faire dès que vous rencontrez votre guide, avant le début de la visite. An awesome tour. Our guide met us at the bottom of the cable car with out ticket for the ride up. A short walk to our driver and van. Andrea was a very knowledgeable guide and did an excellent job! Constantina was an amazing tour guide. She made us feel like family. Santorini was the highlight of our vacation thanks to her. I would highly recommend Viator and ask for Constantina. You will not be disappointed. Santorini is a beautiful island but with 4 cruise ships in port on the same day, it was overwhelmingly crowded. We started our tour in Fira and took the cable car to the top of the cliff to reach the town. Our tour guide met us at the bottom and we rode up to meet the driver. It was early in the morning and our first stop was Mt. Profitis Ilias, the highest point and the location of a monastery. As we are driving for about 30 minutes, there was a lot of fog and once we reached the top, we could see nothing! The tour guide also told us that she had never been to the monastery when it was open so she wasn't sure we could get in. She should have told us this and offered another alternative than going to some spot with fog and nowhere to go! That was very disappointing. We would have preferred to spend the time in beautiful Oia. Oia was the highlight of the tour but it was very crowded due to the number of ships in port. The trip was also scheduled to last 4.5 hours but she took us back to Fira after 3 hours. She seemed to be in a hurry to leave us! Once in Fira, we had a wonderful lunch on our own overlooking the water and left to catch the cable car around 2 pm. The line was probably at least 2 hours so we walked down the donkey trail to catch the tender boat at the bottom. That was horrible! The smell and the number of donkeys was unbearable. The trail is also uneven and difficult to navigate, trying to avoid donkeys and their deposits along the route! Santorini is beautiful but these annoyances will probably be what we remember the most! island. I wish we could of had her longer though. Guide was 'ok'... Not too much info provided, was pleasent.. Too much money for this tour! Not worth it. Simone is an excellent guide: courteous, informative, and sensitive to our needs. He met us on the pier at 8.30am (we were scheduled at 9.00am). Santorini is a "tendered" port so we took a boat early enough to make it by 9.00am. We rode the aerial tram up to Fiar and walked through the town (shops) to the van waiting for us at the bottom of the hill ( I was thinking that the hill was a breeze going down but the trip back would be hard and that is correct). We drove first to the highest point of Santorini and visited the chapel there looking over spectacular scenery....you can see the entire island which is actually one edge of the caldera. Then on to Oia (eea). 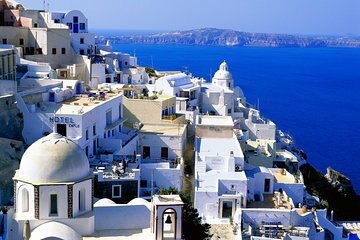 This is where most of the pictures that are seen worldwide are taken of the white buildings and churches with the blue domes sitting on a side of a cliff with the blue, blue, Aegean Sea in the background. Fantastic scenery. Again, not easy for the walking challenged but well worth going through the efforts. The gelato there is mahvelous. Back to Fiar for lunch and shopping. Ate at the Volcano Blue restaurant and finally had a taste of authentic Spanakopita which interestingly, they called Spinach Pie. Portions were huge and tasty. More shopping and back to the ship by aerial tram where the tender is waiting to take you back to the ship. Although tour and guide were good, we were very disappointed that it was not as advertised. Excursion was supposed to begin with a boat ride from harbor to Actinios. We specifically chose this excursion for that reason, to avoid the cable car ride (or donkey ride, or walk) up to Fira. When we arrived, our guide, Simone, claimed to know nothing about the boat ride, and we took the cable car to the top.